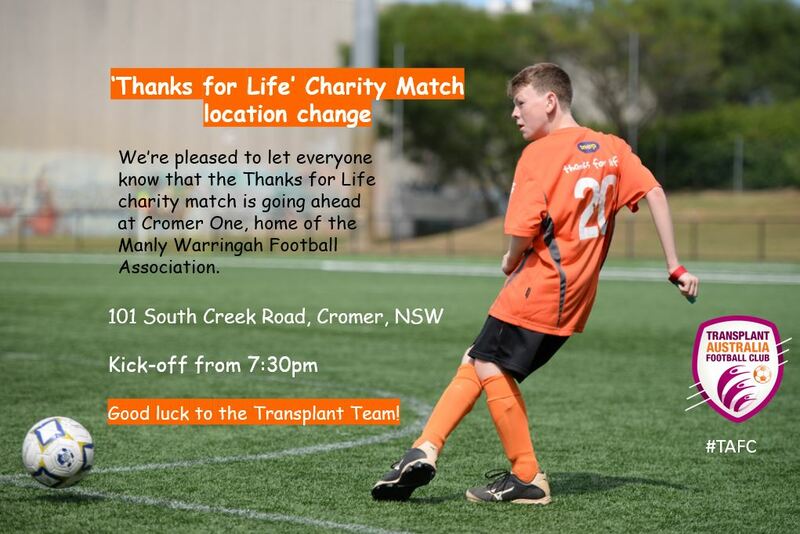 Due to Sydney’s wet weather, the ‘Thanks for Life’ Charity Match between the Transplant Australia Football Club and the Belrose-Terrey Hills Raiders is taking place at Cromer One, home of the Manly Warringah Football Association. Originally slated for tomorrow morning. the teams will kick-off at 7:30pm in a rematch of last year’s contest, which saw the TAFC go down in a valiant 1-0 to the Raiders. Playing for the Doujon Zammit Shield, the orange jerseys are looking for their maiden victory. Consisting entirely of those whose lives have been saved by organ and tissue donation, the Transplant Australia Football Club finished 2016 in style with an exciting 3-3 draw with the NSW Police Riot Squad at the Australian Transplant Games. Now they plan on building on that result by coming home with the shield this weekend. If you’re in Sydney, head up for the match.